In this high impact masterclass session Ronke Lawal will be providing strategic insight into how individuals can boost their personal brands. This is ideal for business owners, entrepreneurs or professionals who want to raise their corporate visibility and business credibility. Delegates will learn how to make more of an impact within their sectors both online via social media and offline at networking events or through public speaking opportunities. Ronke will also show delegates how to use PR tactics to raise their personal brands effectively, develop effective relationships and build a community of personal brand ambassadors who will champion them throughout their career or business journeys. The Power of A Personal brand - how having a strong personal brand can make an impact on your overall marketing strategy and open up new opportunities in your business or career journey. Using PR to enhance your profile - Using public relations strategies to enhance your public profile. Identifying your values & Knowing your purpose - Understanding what your brand is and how you can maintain your integrity and authenticity. Social Media strategy - How to use social media platforms to raise your visibility. Public Speaking Tips - Advice and guidance on becoming a more confident public speaker. Measuring Success - Assessing Long term goals and celebrating success. 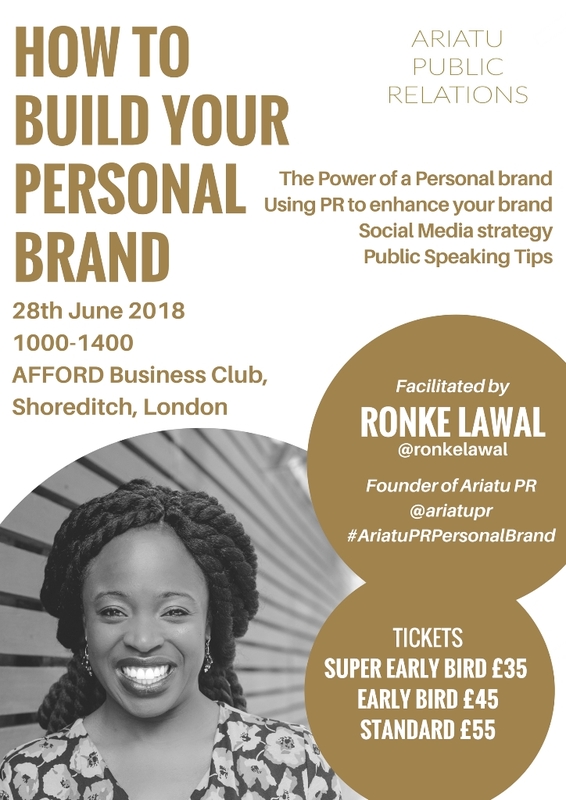 Ronke Lawal, Founder of Ariatu PR is dedicated to seeing small business shine and succeed, using over a decade of business experience she will be giving business owners an overview of how to use PR to gain media coverage and ultimately grow their business. Understanding different types of media - The various layers and types of media. Understanding PR and the media, and the impact it has on business growth. Telling Your Business Story - How to write a great press release with a winning headline. Identifying Your Audience - Learn how to position the brand to get the right press in front of the right audience. Use Social Media To Make An Impact - Pinpointing the best social media platforms necessary to amplify the brand. The nearest station is Shoreditch High Street. The venue is a short bus ride away from Liverpool Street and Bethnal Green stations (10 minutes by foot). Though there may be some pay per hour parking it is advisable to check before driving. Laptop, smartphone, notepad, pen and a smile. You may transfer your ticket to another event. Yes but please send a note. In this high impact seminar Ronke Lawal will be providing strategic insight into how individuals can boost their personal brands. This is ideal for business owners, entrepreneurs or professionals who want to raise their corporate visibility and business credibility. Delegates will learn how to make more of an impact within their sectors both online via social media and offline at networking events or through public speaking opportunities. Ronke will also show delegates how to use PR tactics to raise their personal brands effectively, develop effective relationships and build a community of personal brand ambassadors who will champion them throughout their career or business journeys. In this high impact seminar Ronke Lawal will be providing strategic insight into how individuals can boost their personal brands. This is ideal for business owners, entrepreneurs or professionals who want to raise their corporate visibility and business credibility. Delegates will learn how to make more of an impact within their sectors both online via social media and offline at networking events or through public speaking opportunities. Ronke will also use PR tactics to show delegates how to use raise their personal brands effectively, develop effective relationships and build a community of personal brand ambassadors who will champion them throughout their career or business journeys. On exiting King’s Cross Underground station turn left and head eastwards on Euston Road and walk for 3 minutes. At the junction continue straight ahead onto Pentonville Road and continue for a further 7 minutes until arriving at Voluntary Action Islington. Buses that run along Pentonville Road include 30, 73, 214. Additional buses that stop at King’s Cross Station include 10, 17, 45, 46, 63, 91, 259, 390. Trains to King’s Cross, St Pancras or Euston. Piccadilly, Circle, Victoria, Hammersmith and City, Northern and Metropolitan lines all pass through King’s Cross Station. Parking meters in the surrounding streets. Please bring a smartphone and notebook. Ronke Lawal, Founder of Ariatu PR is dedicated to seeing small business shine and succeed, using over a decade of business experience she will be giving business owners an overview of how to use PR to improve credibility, gain media coverage and ultimately grow their business. In this comprehensive business seminar small business owners and entrepreneurs will learn how to undertake their own PR campaigns. Understanding PR the media, and the impact it has on business growth. Telling Your Unique Business Story - How to write a great press release with a winning headline. Identifying Your Audience - Learn how to build brand reputation and credibility and how to position your brand to get the right press in front of the right audience. Use Social Media To Make An Impact -Pinpointing the best social media platforms necessary to amplify the brand and manage brand reputation. How To Use PR to Grow Your Business - Using media coverage to attract new customers and clients. By the end of the seminar each participant should feel confident enough to use PR to manage their brand reputation and get media coverage for their business. In this high impact seminar Ronke Lawal will be providing strategic insight into how individuals can boost their personal brands. In this comprehensive business seminar small business owners and entrepreneurs will learn how to undertake their own PR media campaigns and get media attention for their business brands. In this comprehensive business seminar small business owners and entrepreneurs from a range of industries including creative arts, the food sector, fashion and beauty can learn how to do their own PR campaigns. Understanding PR and the impact it has on business growth. Use Social Media To Make An Impact -Pinpointing the best social media platforms necessary to amplify the brand. By the end of the seminar each participant should feel confident enough to get media coverage for their business. Metrolab is conveniently located for easy access to Central London only 5 minutes’ walk to Kings Cross St. Pancras, 5 Minutes’ walk to Mornington Crescent Tube station and 10 minute walk to Camden Road overground station. Bring your smartphone/laptop/tablets for interactive engagement during the seminar. We will get online to review certain PR and social media elements. In this comprehensive business seminar small business owners and entrepreneurs will learn how to do undertake their own PR campaigns for their businesses. The seminar takes place in one of the newly developed Royal Arsenal Riverside complexes with state of the art facilities and only 5 minutes walk away from Woolwich Arsenal DLR/Woolwich Arsenal Train station, just around the corner from the Woolwich Arsenal Crossrail Site - simply cross the Plumstead road to get to Royal Arsenal and follow the map below.